After eliminating a subsidies program in 2005, Japan is considering an incentive program to give its solar companies an edge and meet emission-reduction goals. Japan may bring back solar subsidies to boost its solar panel makers’ competitive edge in the world market, two ministry officials told Reuters on Monday. Japan, the first country to introduce federal solar subsidies, eliminated them in 2005. Since then, it has witnessed some of its solar-cell makers getting beat in the global market. Q-Cells in Germany overtook Sharp as the world’s largest supplier in 2007, and Suntech Power in China kicked Kyocera out of the third place. Keeping its lead will take more than resurrecting an incentive program, however. For one thing, Sharp fell from the No. 1 spot partly because it had trouble getting enough silicon. Besides, Japan represents a small market compared with Germany and the United States. The Asian country was the fourth-largest market for solar-panel installations in 2007, said Jenny Chase, senior associate with New Energy Finance, a market research firm in London. Japan didn’t see a significant drop in solar panel installations after ditching the incentive program in 2005. The country installed 290 megawatts of panels in 2005 and 230 megawatts in 2006, Chase said. Regional governments have continued to offer subsidies after the national program ended. A new government program will not likely make a big difference in giving Japanese companies a big advantage in the global market, Chase said. Scant details are available about Japan’s potential incentive program. The Ministry of Economy, Trade and Industry expects to receive recommendations from a panel scheduled to discuss tax incentives and other subsidies that could cut the cost of putting up solar panels at homes by 50 percent Tuesday, Reuters reported. A number of governments have enacted incentive programs to boost renewable energy use and cut greenhouse gas emissions. By increasing the demand for solar energy, the programs also create a larger market for international solar companies, not just the domestic ones. But analysts have credited Germany’s attractive solar incentive program for helping to build homegrown companies that can now move quickly into new markets (see South Korea Expands Solar Production and Epuron Expands Into South Korea). A new incentive program in Japan would help the country meet its clean-energy goals. Japanese Prime Minister Yasuo Fukuda this month said the country plans to cut greenhouse gas emissions by 60 percent to 80 percent from the current levels by 2050. The goals included adding solar panels to more than 70 percent of the new residences by 2020. Overall, Japan has 1.9 gigawatts of installed panels and aims to increase the total to 4.82 gigawatts by 2010. 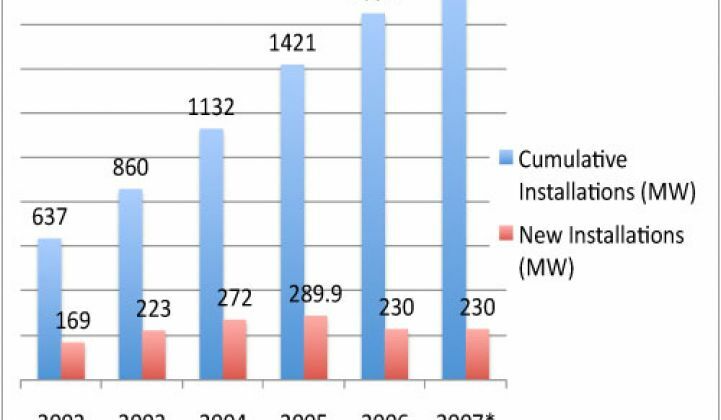 Germany already reached 1.15 gigawatts in total installation in 2007, Chase said. Japan and other countries have so far failed to meet the emission targets set by the Kyoto treaty (see Adding New Fuel Standards, Solar Incentives and Japan’s Wind-Power Problem). Learn the facts about solar finance at our seminar at Intersolar North America on July 16, 2008 in San Francisco. Click here to register or for more details.